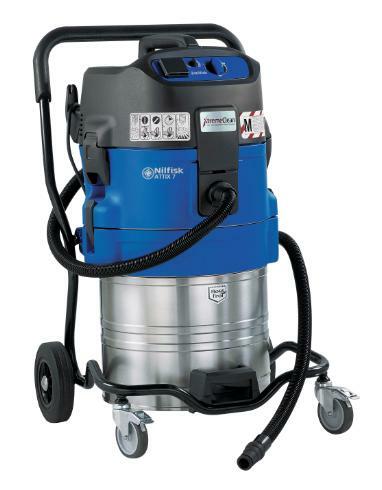 The ATTIX 7 features a 70 litre stainless steel container which can be emptied by tilting or lifting off of the robust steel frame, as well as the Automatic XtremeClean filter cleaning system and Automatic Start/Stop. Truly an Industrial Class performer. our operating costs are minimised with the washable PET Fleece filter element and the low noise level enables operators to work when others are near by without disturbance. The Automatic Start/Stop is ideal for those who use the machine with electric hand tools because starting or stopping the tool starts and stops the vacuum, as well. An Airbox is available as an accessory which performs the same function when using pneumatic tool.